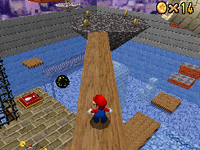 Top o' the town is the second mission of Wet-Dry World in Super Mario 64 and Super Mario 64 DS. The mission's objective is to climb to the top of the uptown. The player needs to raise the water level to the point where they can climb to the upper-most layer of the uptown, if it isn't already. Another option is to use Heave-Hos and Triple Jumps to reach the upper layers. 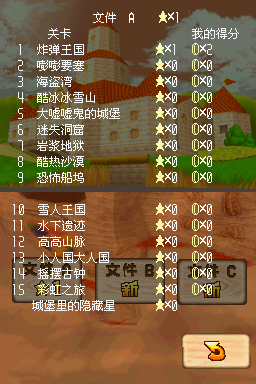 Once on the top layer, the player has to avoid the Chuckya and jump onto the long, narrow board and cross it, avoiding the two Amps (or one Amp in the DS version) along the way. When one the other end, the player has to avoid the Keronpa Ball (which is absent in the DS version) and jump to the spinning platform. The Power Star is on the next platform in a ! Block, though the Power Star is out in the open in the DS version. This page was last edited on September 21, 2018, at 12:03.